Most chefs recommend that you should add quite a bit of salt to boiling water which you cook pasta in (sometimes 1 teaspoon). For those watching their sodium intake, how much of this salt will actually end up being absorbed by the pasta, and how much will be thrown out with the water? Here is a report entitled "Change in sodium content of potato, pasta and rice with different cooking methods". The sodium content in pasta cooked with different levels of salt increased approximately linearly with the amount of salt added to the cooking water. Pasta cooked in 4g salt/100g raw took up on average 28 mg Na/100g whereas when cooked in 40g/100g raw this increased approximately 10 fold to 230 mg Na/100g. This study from "Cereal Chem. 64(2):106-109" was helpful in answering the question. One example: Using 71 gm Dry Spaghetti, 592cc water, 2.6 g salt (based on 5.5gm salt/tsp): 100mg cooked spaghetti contained 1.8 mg Na prior to cooking, 0.9 mg Na when cooked in unsalted tap water, 107mg Na cooked in salted water (see above), and 77mg Na when cooked in salt water and then rinsed. According to the article, different shaped pastas varied the result. I can't really give you medical advice if you're on a low-sodium diet, but pasta cooked in salted water definitely absorbs some of the salt along with the water. That's the purpose of salting the water: to season the pasta throughout. You can reduce or omit the salt if you think you need to, but your pasta will be less tasty. If you really want to science it up, you can calculate the concentration of the salt in the amount of water you're using (weight of salt / weight of water), then multiply by the difference in the weight of the pasta before and after cooking (the amount of water absorbed). That should give you the approximate amount of salt absorbed by the pasta. 40% of that is the weight of the sodium in table salt (NaCl). I think you'll find that it's a lot less sodium than you would get from consuming processed food, and is not likely to be a health risk. However, if you need to measure the exact amount of sodium you're taking in, that's the way to do it. I don't know the exact answer, but you can find it out reliably yourself. It will requires some time and patience. You measure the weight of salt that you add to water and the volume of water. Then you cook pasta and measure the volume of water again. You pour some little but precisely known amount of after-pasta water into an open plastic container and let water evaporate. Since after-pasta water will go bad at room temperature you can wait until it cools down and put into the freezer - it will still evaporate, but much slower (maybe you'll need to wait a couple of months). Once all the water evaporates only salt is leaft in the container and you can weight it again. The concern is sodium, not salt. If you cook pasta according to package instructions, then the salted water will pass a high level of sodium into the pasta. 1 teaspoon of salt contains 2,350 mg of sodium. A teaspoon of salt weighs 6 grams. If you cooked a full pound of fettucini let's say using the water level instructed on the package and added 3 tablespoons of salt, you'd be soaking the pasta in 22,000 (approximately) mg of sodium. Nearly 70 to 80% of that would pass into the pasta and much of the water would evaporate. 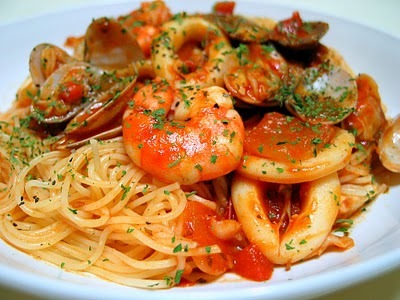 Some cooks/chefs then use the pasta water to cook the balance of a meal, securing even more sodium into the plate being served. If you're on a low sodium diet, don't cook the pasta with salt at all. It is not necessary. A half teaspoon of extra virgin olive oil will keep the water from boiling over the pot and not affect the pasta sodium-wise at all. Here is the best answer. Only about 3% of the sodium added to the water will absorb into the pasta, but 3% can be a lot, given that there are 2300 mg in a teaspoon of table salt! If you follow the link below, you'll find the accurately measured amount of sodium absorbed into 6g of pasta at different measurements of salt added to the water. Always take into account serving size and number of servings! Not the answer you're looking for? Browse other questions tagged pasta salt boiling or ask your own question.